New York City during World War II wasn't just a place of servicemen, politicians, heroes, G.I. Joes and Rosie the Riveters, but also of quislings and saboteurs; of Nazi, Fascist, and Communist sympathizers; of war protesters and conscientious objectors; of gangsters and hookers and profiteers; of latchkey kids and bobby-soxers, poets and painters, atomic scientists and atomic spies. 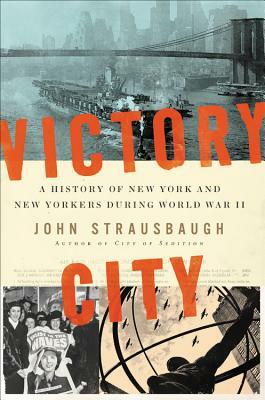 In VICTORY CITY, John Strausbaugh returns to tell the story of New York City's war years with the same richness, depth, and nuance he brought to his previous books, City of Sedition and The Village, providing readers with a groundbreaking new look into the greatest city on earth during the most transformative -- and costliest -- war in human history. John Strausbaugh has been writing about the culture and history of New York City for a quarter of a century. City of Sedition, his singular history of New York City's role in and during the Civil War, won the Fletcher Pratt Award for Best Non-Fiction Book of 2016; The Village, his epic history of Greenwich Village, has been widely praised and was selected as one of Kirkus Review's best books of the year (2013). His previous books include Black Like You, a history of blackface minstrelsy; and E: Reflections on the Birth of the Elvis Faith.